Tobacco mosaic virus, with the RNA genome in red. Tobacco mosaic virus (TMV) has been at the center of virus research since its discovery over a hundred years ago. TMV was the first virus to be discovered. Late in the 19th century, researchers found that a tiny infectious agent, too small to be a bacterium, was the cause of a disease of tobacco plants. It then took 30 years of work before the nature of this mysterious agent became apparent. In a Nobel-prize-winning study, Wendell Stanley coaxed the virus to form crystals, and discovered that it was composed primarily of protein. Others quickly discovered that there was also RNA in the virus. Then, many prominent structural researchers (including J. D. Bernal, Rosalind Franklin, Ken Holmes, Aaron Klug, Don Caspar, and Gerald Stubbs) used X-ray diffraction and electron microscopy to probe the structure of the virus. Several structures of the whole tobacco mosaic virus are available in the PDB, including the ground-breaking one solved by X-ray fiber diffraction (shown here from PDB entry 2tmv ), and a recent structure solved by analysis of many electron micrographs (PDB entry 2om3 ). The virus is composed of one strand of RNA (shown in red) wrapped inside a sheath of protein (shown in blue). The protein coat is composed of about 2130 copies of a small protein, which stack like bricks in a cylindrical chimney. The RNA strand encodes four proteins, which together orchestrate the life cycle of the virus. These include two proteins that replicate the viral RNA, a protein that transports the RNA from cell to cell, spreading the infection, and the capsid protein seen in the PDB structures. Tobacco mosaic virus is very stable, so stable that it can survive for years in cigars and cigarettes made from infected leaves. The viral RNA is infectious by itself, but the addition of a protein coat protects the RNA from enzymes that would destroy it. 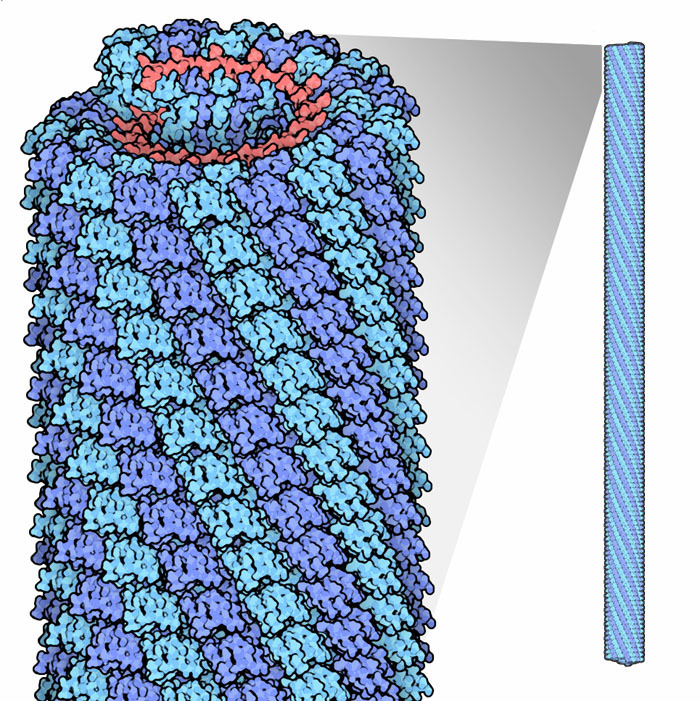 The protein coat poses a problem, however: it must be removed once the virus gets inside a cell. TMV uses two tricks to release its RNA. As with many viruses, TMV has a chemical switch that causes the protein to change when the environment changes. The capsid protein has several clusters of acidic amino acids that are stable outside of cells, where calcium levels are high, but repel one another in the low-calcium conditions inside cells. This is enough to loosen the first few capsid proteins, releasing the end of the RNA. TMV then uses ribosomes as the engines to finish the job. As the ribosomes move down the strand, creating the first set of virus proteins, they displace the remaining capsid proteins. One of the many surprises found during the study of TMV was its mode of assembly. If you mix the RNA and capsid proteins together, they spontaneously form functional viruses. You might imagine that this would happen by simply stacking proteins from one end to the other, zipping up the RNA strand inside. However, a two-step process is actually used instead. First, the TMV protein forms a two-layer disk, with 17 proteins in each ring. A special initiation sequence in the RNA then binds in the hole at the center. This causes the disk to dislocate, forming a lockwasher shaped ring with 16 1/3 subunits per turn . The remaining subunits then stack on this structure, elongating until the RNA is covered. There is a great advantage to this two-step process: the need for an initiation sequence in the RNA ensures that only virus RNA is packaged into viruses. The structure shown here, from PDB entry 1ei7 , contains four stacked rings of 17 subunits. The two rings at the center are thought to be similar to the structure that initiates the assembly. The lockwasher ring is shown on the next page. PDB entries 2tmv and 2om3 include both the protein and the RNA in an infectious TMV particle. The illustration shown here includes only 17 subunits, along with RNA that is bound to them. Notice how the RNA is bound in a groove in the protein near the center of the ring. Three nucleotides bind to each protein subunit. The image on the right shows the clusters of acidic amino acids (bright red) that are important for disassembly of the virus inside infected cells. You can click on the illustration for an interactive Jmol version. For a closer look at these acidic amino acids, take a look at the page at Proteopedia. 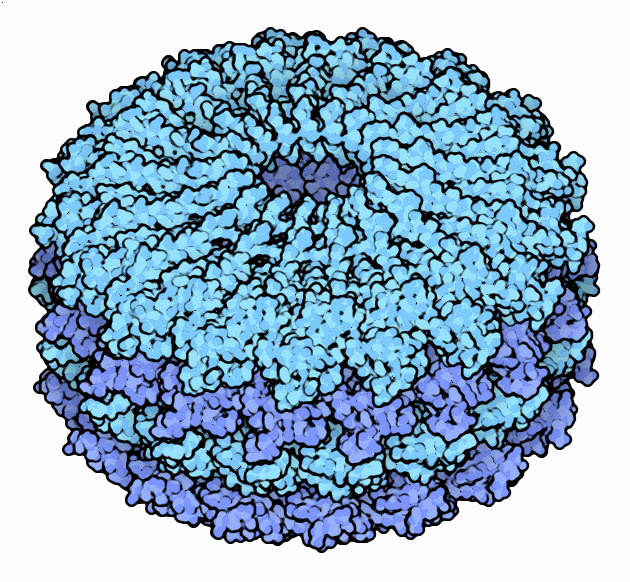 Most of the viruses in the PDB are composed of a spherical shell of capsid proteins. Can you find other examples of cylindrical viruses like TMV? Purified TMV particles are all a very uniform 300 nanometers in length. What aspects of the structure would limit the length of assembling TMV particles? H. Wang, A. Planchart and G. Stubbs (1998) Caspar carboxylates: the structural basis of tobamovirus disassembly. Biophysical Journal 74, 633-638. D. J. Lewandowski and W. O. Dawson (1998) Tobamoviruses. In Encyclopedia of Virology, second edition, volume 3, edited by A. Granoff and R. G. Webster, Academic Press, pages 1780-1783. B. D. Harrison and T. M. A. Wilson (1999) Milestones in the research on tobacco mosaic virus. Philosophical Transactions of the Royal Society of London B 354, 521-529. A. Klug (1999) The tobacco mosaic virus particle: structure and assembly. Philosophical Transactions of the Royal Society of London B 354, 531-535.